We love crafting in this house and as usual E gets excited when a box of crafts turns up from Baker Ross, the latest box was full of fantastic Easter Crafts. 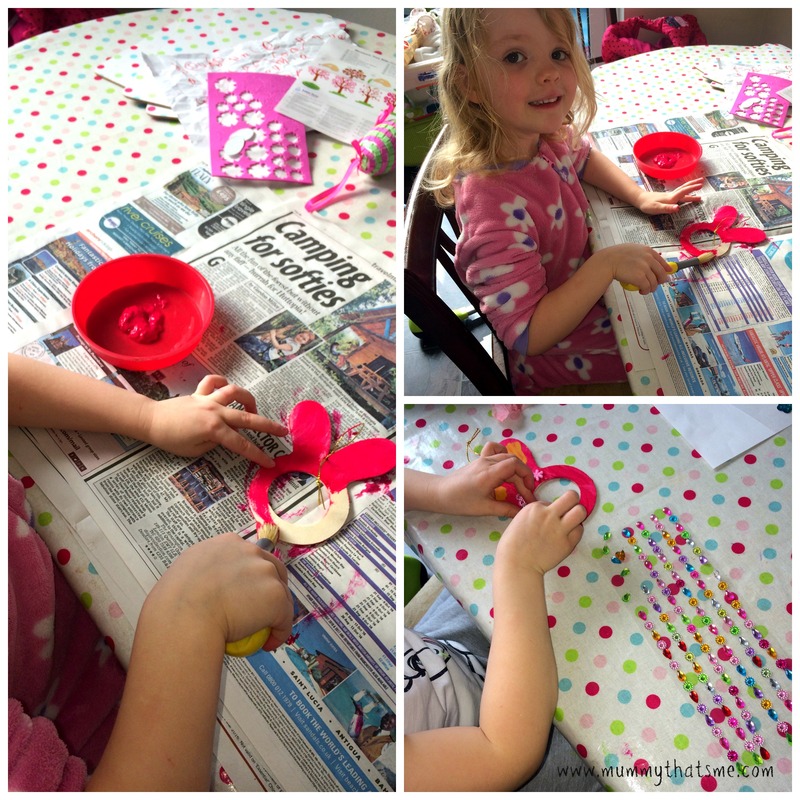 We have had a lot of fun with these crafts and it has added to the excitement of Easter. 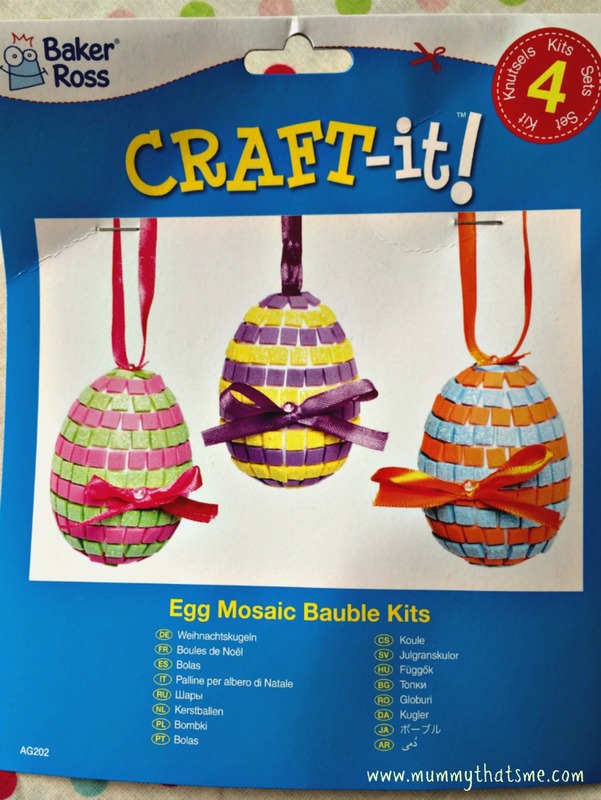 The first craft we started with is Egg Mosaic Bauble Kits. 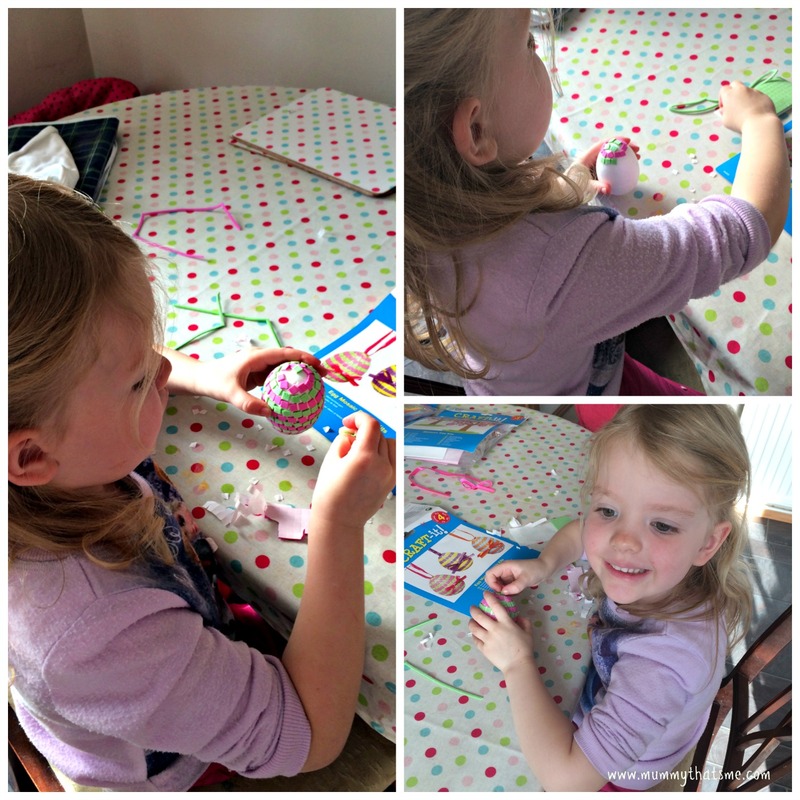 E was excited to make one of the baubles as they look so good on the photo. I wasn’t quite sure how E’s was going to turn out. The craft itself is very simple, you take a polystyrene egg shape and then use a two colour combination out of the self adhesive square stickers included in the pack. E wanted to make a pink and green one as shown on the front of the packaging. As you can see in the photos that E was concentrating – this alone impresses me! The craft took quite a while to do and she was very precise about putting the squares on, on a few occasions she moved them so they were level with the others. As always crafts involve using self adhesive stickers I love, one because it’s essentially mess free and secondly E feels very independent as she doesn’t need to ask me for help. 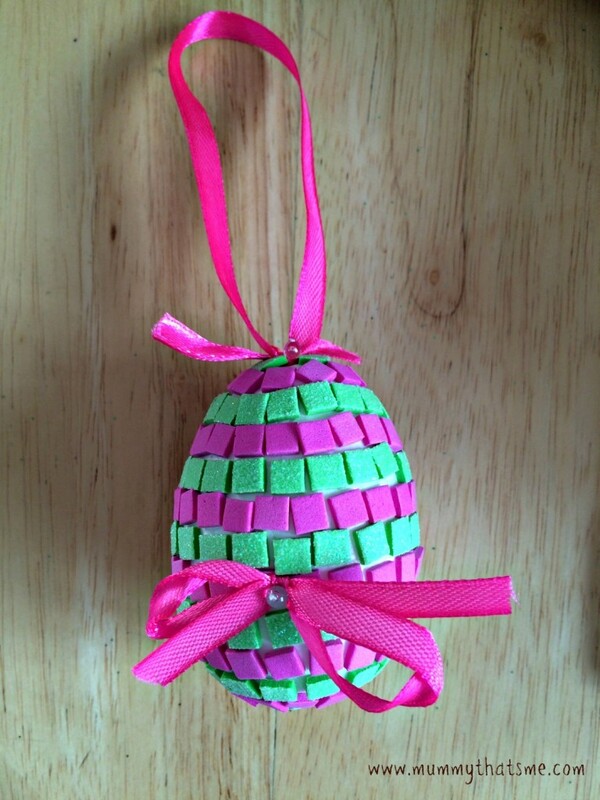 Once E had stuck all the squares onto the egg all that was left to do was attach the bow and ribbon to hang it up by. The Bows are ready made so there is no fiddly making bows that need doing, The craft comes with a couple of little plastic pins and all you have to do is pin it through the bow and the same with the hanging ribbon. As you can see once it is complete is looks really lovely. 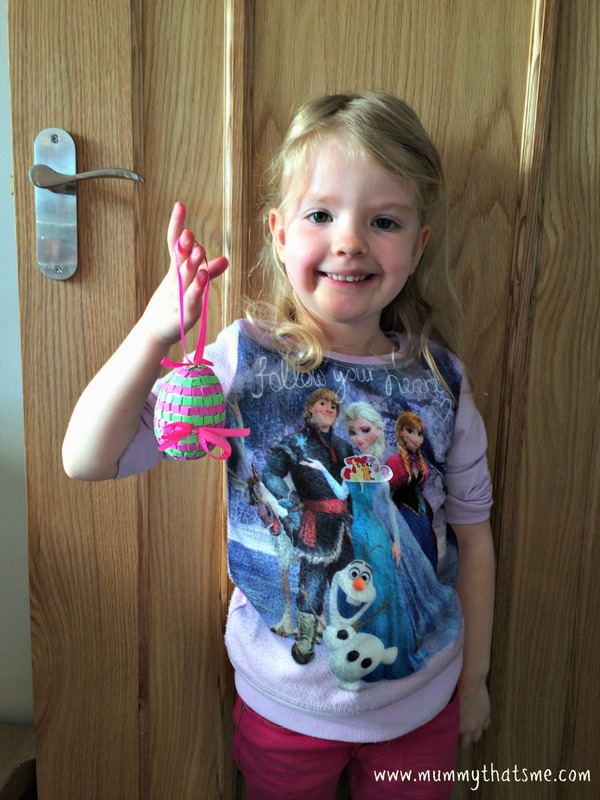 E loves her egg mosaic bauble and because she did it herself she is very proud of it and loves showing it to everyone. Next we moved onto the Bunny colour in masks. These masks look so cool, there are three different masks to choose from in a pack of six. 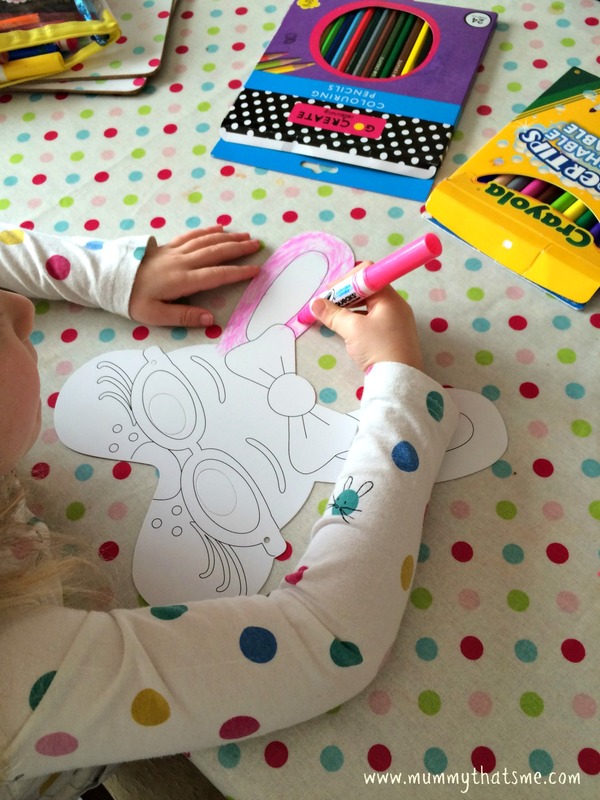 E decided she wanted to colour in the more girly looking bunny mask. As there was quite a lot to colour and E’s attention span with colouring is short lived she completed the mask on and off during the day. E wanted to colour the bunny in the same colours a shown on the front of the packaging. Once the mask has been coloured in the pack includes some elastic to thread through so you can wear it, there are two holes at either side where you thread the elastic through and as it has a special end piece it doesn’t come undone. The completed mask looks great, i am impressed with how neat E’s colouring is. E loves her mask and has even taken it into school to show everyone in her class. 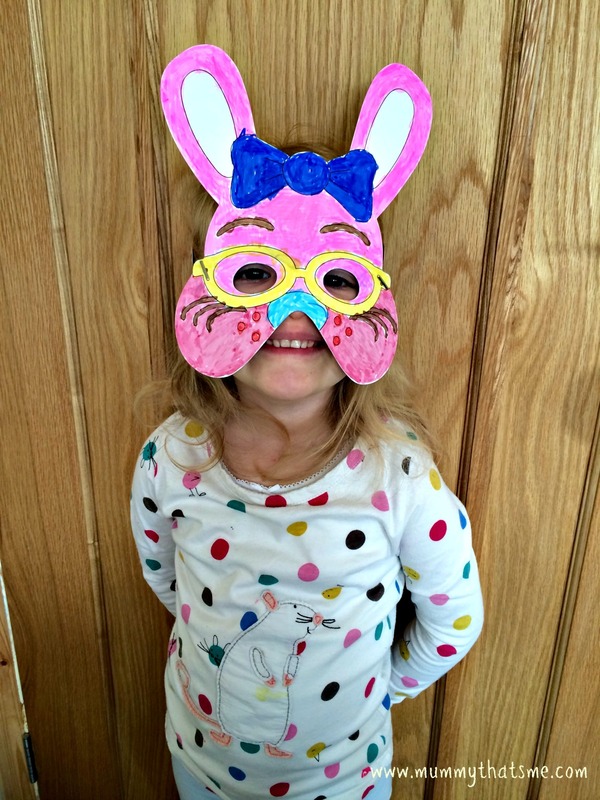 The Easter Bunny Colour in Masks cost £2.75 for a pack of six. This really is a lovely craft that E has enjoyed doing, apparently she is now going to colour one for her daddy to wear! 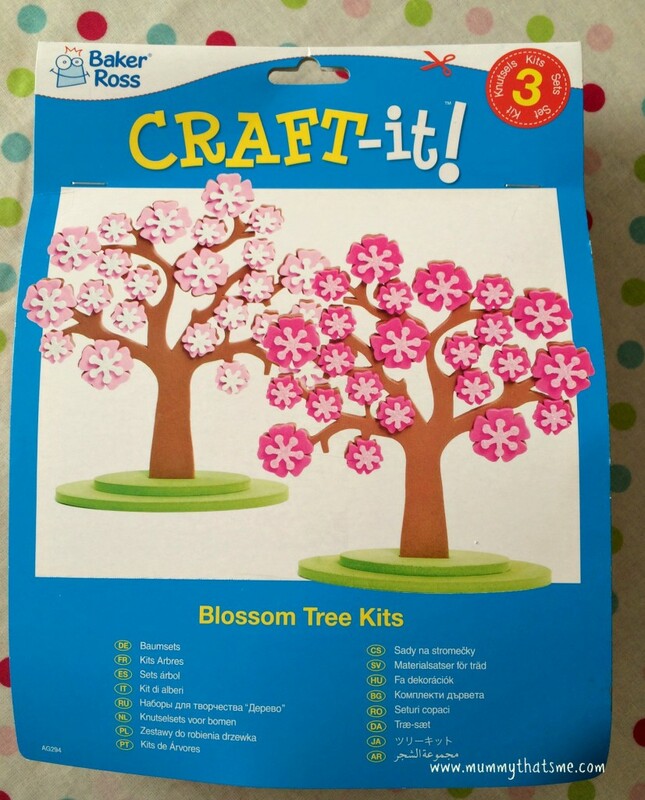 The next craft we went onto do is the Blossom Tree kits. This is another wonderfully simple craft that look lovely when it has been done. 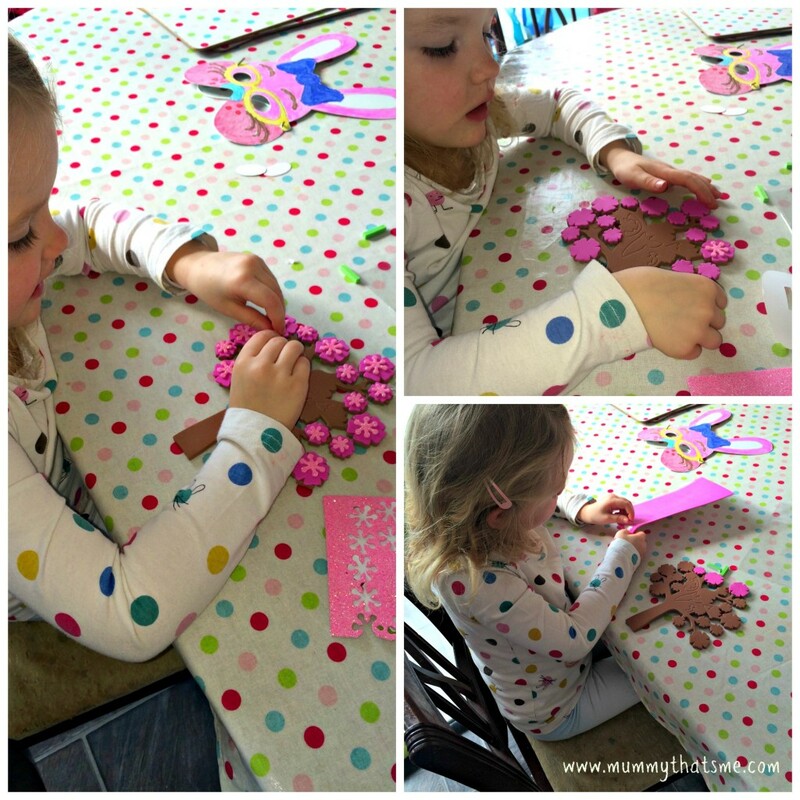 This is a fab self adhesive sticker craft – you can imagine my excitement when we opened the pack to discover that. It was time to put the kettle on and get the Jaffa cakes out and sit with E whilst she happily made the blossom tree with only a little guidance. There is a ready made tree shape and then two lots of stickers for the blossoms, which include small and larger pieces of blossoms and then some lovely little sparkly stickers to put on top of the blossoms. Once the tree is complete you just put it into the base that has also been made by sticking two pieces together, you then have a lovely looking tree. 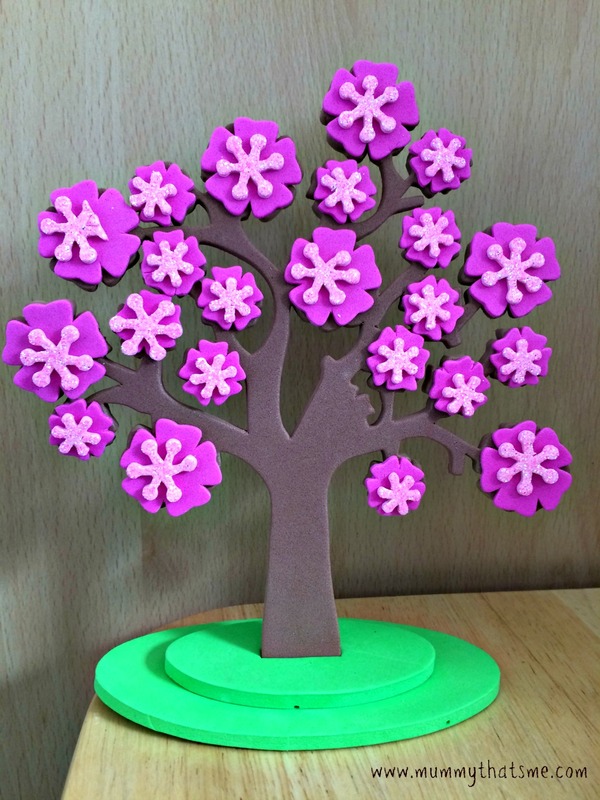 This lovely Spring Blossom Tree Craft is easy to do and costs £3.45 for a pack of three. E has put hers on our mantel piece so that everyone can see her lovely creation. 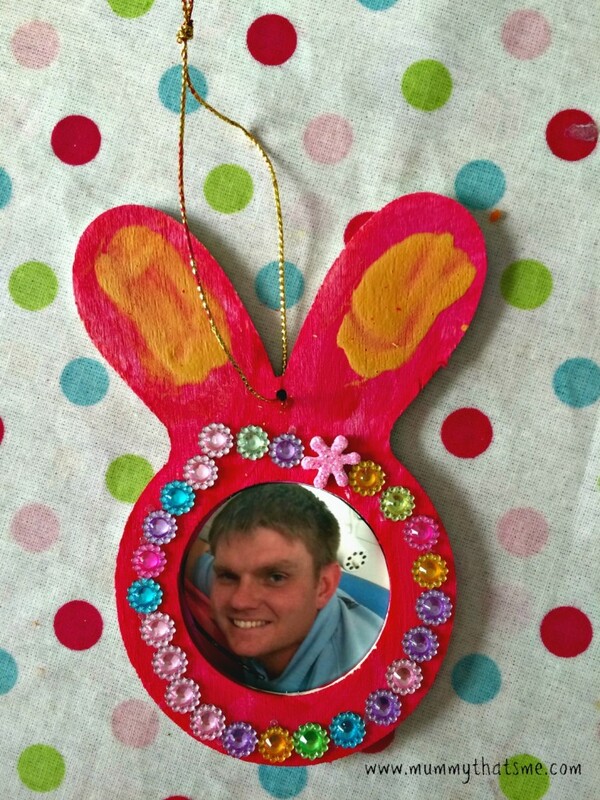 The final crafts we had to make is the Bunny wooden photo decorations. E was looking forward to making these as she wanted to get the paint out to paint her bunny. Because she was using paint the craft took place over a couple of days due to waiting for the paint to dry. Firstly E painted the bunny a lovely hot pink colour, I tried to explain to her about painting the colour of the ears first but E didn’t want to. Once the paint had dried she then painted part of each ear yellow, the colour isn’t as bright as it would have been as E had to paint it over the pink. Once the bunny had dried I told her that she could decorate it if she wanted. E went straight towards some sparkly gems and stuck them around the edge. Once E had painted and decorated the heart she chose a photo to put inside the decoration. 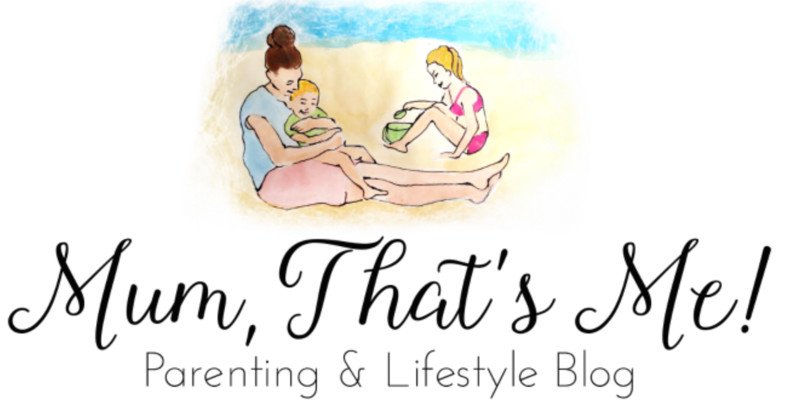 My husband isn’t mentioned much on this blog but his photo does seem to always appear in any photo related crafts that E makes. The end product as you can see looks really good. 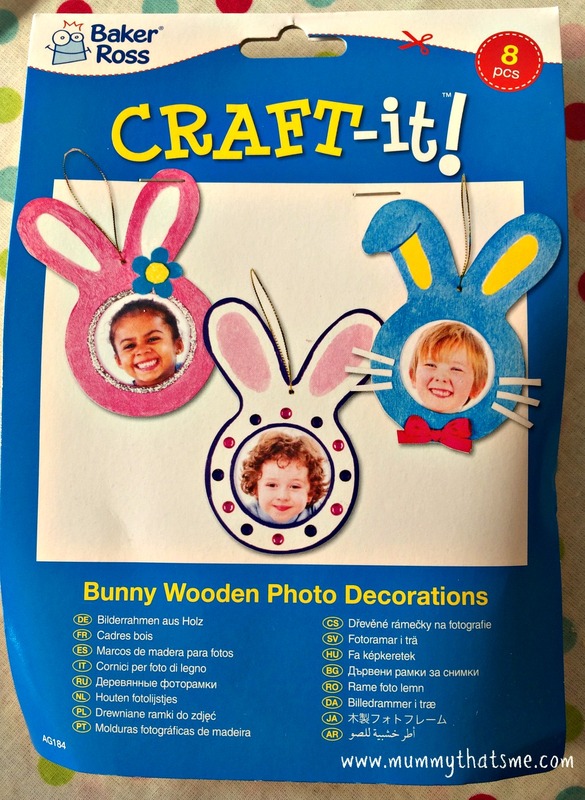 These lovely Bunny Wooden Photo Frames costs only £2.95 for a pack of eight. E has enjoyed making all the Easter crafts, I can totally recommend the above crafts if you are looking for some Easter themed crafts. Baker Ross also sells a wide selection of other Easter crafts that also look great. Not only do Baker Ross have a variety of fab toys that are great for stocking fillers or party bags. 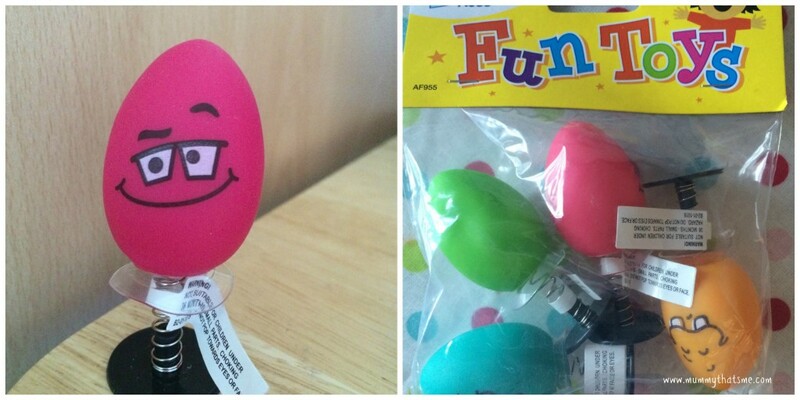 We have been sent a pack of Funny Face Egg Jump-ups, all you have to do with these cute eggs is push them down and watch them jump up, E thinks these are brilliant and likes to have a competition to see who’s egg can jump the highest! These would make good party bag toys or something different to entertain some children over Easter. A pack of four costs £1.75. Disclosure – We were sent the above crafts to try out and review.